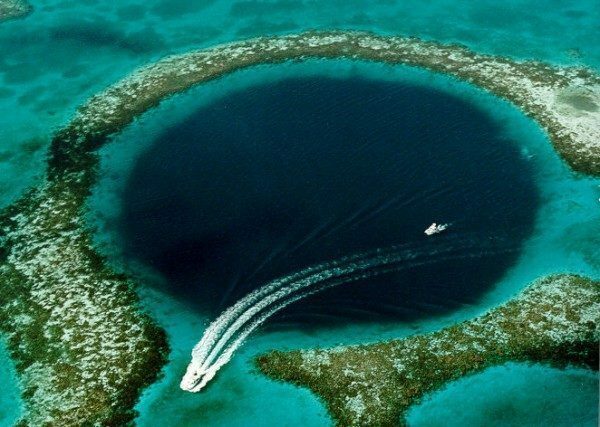 The Great Blue Hole… It is like the holy grail of diving spots in Belize. I’ve been fascinated by this unique diving spot for a long time, even before becoming an advanced open water diver a month ago in Placencia. Actually, diving the Blue Hole was one of my main reasons for becoming an advanced diver, as this certification level is required to dive here. The Great Blue Hole is part of the larger Belize Barrier Reef Reserve System, a UNESCO site and one of the unique natural wonders Belize has to offer. The sharp contrast of the 300-meter diameter navy blue sinkhole against the clear turquoise waters and reefs that surround it makes the Blue Hole an interesting and odd natural feature that attracts diving enthusiasts and snorkelers from around the world. While you can reach the Blue Hole from almost any part of Belize, the two main departure points are either Caye Caulker or San Pedro in Ambergris Caye. My trip to the Blue Hole started at 5:30 am when I met with the guys from Big Fish Diving Center in Caye Caulker to pick up the diving equipment I had selected and fitted the day before. Big Fish is a local dive shop, but they are really good and very professional with their dives, plus they are cheaper and the Dive Masters are extremely friendly. The over two hours boat ride to Lighthouse Reef, where the Blue Hole is located, was mostly uneventful but it was a great opportunity to get to meet the other divers who I shared the experience with. 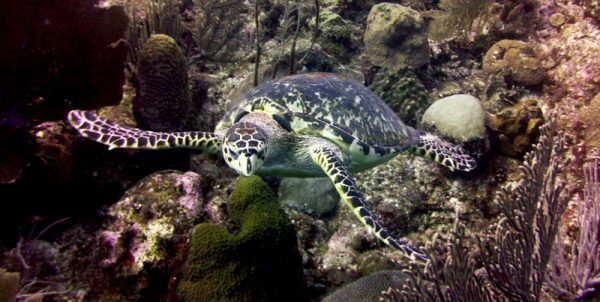 While the ride is a long one, it is well worth it since this dive trip is not just one dive at the hole and return to land; this is a 3-tank dive with the two other sites being Half Moon Wall and Long Caye Aquarium – both also at Lighthouse Reef. I admit that it gave me chills when the captain said, “Ladies and gentlemen, we are in the Blue Hole.” The reef that surrounds the hole like a ring has two entrances that allow boats to pass in and anchor on top of it. Since the Blue Hole is the main attraction of the trip and the deepest of the three dives, descending to 130ft (40m), it was the first one on the list. After getting briefed with our dive plan for the day, we suited up and got ready for our step-in entry into the water. As I deflated my BC, I could feel my body descending, the pressure slowly building, the colors fading, the sea life vanishing. 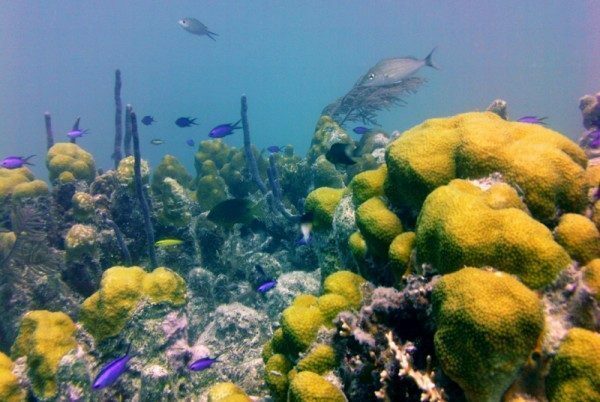 While the Blue Hole is the most famous dive site in Belize, it is definitely not the most beautiful in terms of sea life and colors. Since the water inside the hole has poor circulation, it has an environment that is unfavorable for most sea life. 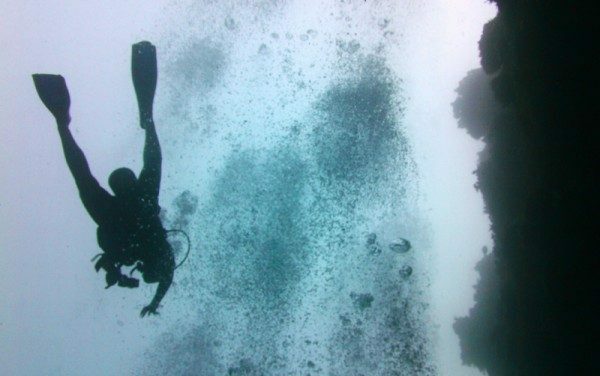 Nonetheless, diving here is still an experience because it IS the Blue Hole. The most interesting part of the dive started when I reached 100ft (30m) in depth – the point where the stalactites, stalagmites and cave features revealed themselves extended into what seemed like a dark abyss. Caves don’t form underwater, but there’s a theory that this cave was once above the water and then flooded when the sea level rose thousands of years ago. Eventually, the roof of the cave collapsed in a perfect circular shape, creating the hole we see today. As we kept descending, we could see below us was a small group of Caribbean Reef Sharks circling the hole unperturbed, as if none of us were invading their space. Once at the maximum depth of 130ft (40m), we swam for eight minutes between the spaces created by the stalactites and stalagmites and the rim of the hole. It felt like if diving in a primitive colonnade of a lost world swollen by the sea. The environment was dark and blue, and the water colder than the one 130 feet above us. Once the eight minutes were up, we slowly ascended to 70 feet and then 50 feet, spending some time at each level to acclimate to the water pressure and to admire the different environments at each level. The higher we went, the more life and we saw. After our mandatory safety stop, we made it to the surface and spent our 1-hour surface time on the boat –on the way to the second dive spot at Half Moon Caye. The second and third dives, even though they are shallower at 70 ft and 50 ft, respectively, they are the best dives of the trip in terms of coral spotting, sea life identification, and colors. The third dive, Long Caye Aquarium, was my favorite since it displayed the biggest and healthiest variety of sea life including nurse sharks, turtles, stingrays, barracudas, lionfish, and many other types of fish and corals. Between the two shallow dives, there was a lunch stop at Half Moon Key, where we had the chance to walk to the bird sanctuary to see the Red Footed Boobies, Ospreys, and Frigate Birds in their natural habitat. Love your underwater photography. Especially those pretty blue fish… What a great experience! Thanks Cherina! It was a great experience indeed! 40m deep? Wow, that looks scary! Wow!! How cool! This definitely looks like an amazing place to go diving. Thanks Cam! Aww, sorry you guys missed it but you had a great reason not to do it. 😉 I’m sure you’ll get to dive it one day! Man, that looks like a lot of fun – that shot of the turtle is incredible! I’m not a diver, but reading posts like this, make me want to get my license. What an incredible place, and the photo of hte Blue Hole is most impressive! Are you sure an asteroid didn’t hit to create this!!? I’ve done quite a bit of diving but never made 40m! John, it really is impressive. This was my first time going down to 40m, I was so excited to be that deep, and surprisingly not scared at all. 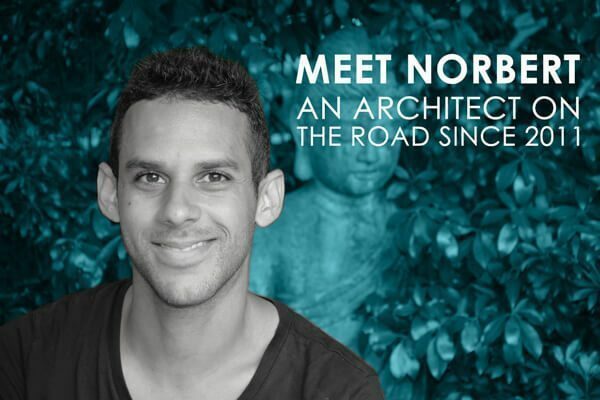 Fascinating Norbert! This IS one of the places I want to dive at. Glad you experienced it with such pleasure. What was the temperature at 40m? I’m suspecting it was about 24C? In fact, I just did a dive at Sipadan Islands a couple of weeks ago and am going back in 10 days time! Thanks David! Surprisingly the temperature at 40m wasn’t as cold as I expected. I had a wet suit, of course, but I didn’t feel too much of a difference from the surface temperature. Actually, my computer marked 81 degrees Fahrenheit (27C) at that depth. I was quite surprised by it. 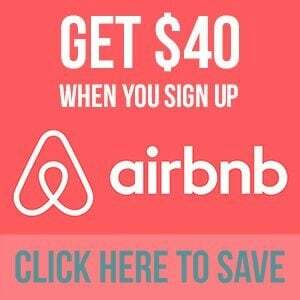 David, whenever you have the chance to go to Belize, don’t miss this dive! I’ve always been hesitant to try diving (my head/ears are super sensitive to changes in pressure), but I feel like I’m missing out on so much by not trying it. So much of the world is under water and I’m missing it! Wow, that’s one dive I definitely want to do! 40m? That is pretty deep, I will also first have to get my advanced certification before heading there. yup, 40m! It is deep! 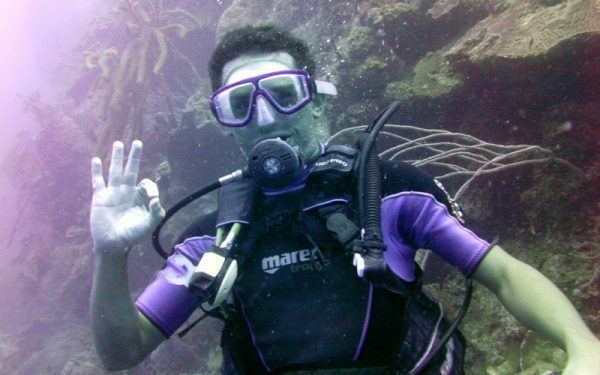 Yes, get your advanced certification so you can do this dive… or actually, you can do it here in Belize where you have beautiful reefs to practice on! Loved this post! The Blue hole is one of my dreams, although im not sure ill get there.. i LOVE water and have always wanted to get my diving license but im terrified of sharks!!! Anyway enough about me… I love this, i would have loved to see more pictures 🙂 BUt the info was great thanks! Hey Sam! Well, you can get your license and dive in places where there are no sharks. 😉 As far as I know, the sharks in the Blue Hole are not dangerous, so you can give it a try.